Nanostructured or porous silicon with and without surface passivation forms a kind of amazing materials that has found wide applications in upcoming technologies such as catalysis, bio- and gas- sensors, biofuel cells, drug delivery and phototherapy of cancer cells with highly biodegradability, photon emission and detection, solar energy harvesting, etc. However, the underlying mechanism for the unusual performance of the pure and passivated nano-Si remains yet its infancy and inconsistency. This work is devoted both experimentally and theoretically to the dielectric, electronic, phononic, and photonic performance of Si upon size reduction and surface passivation. 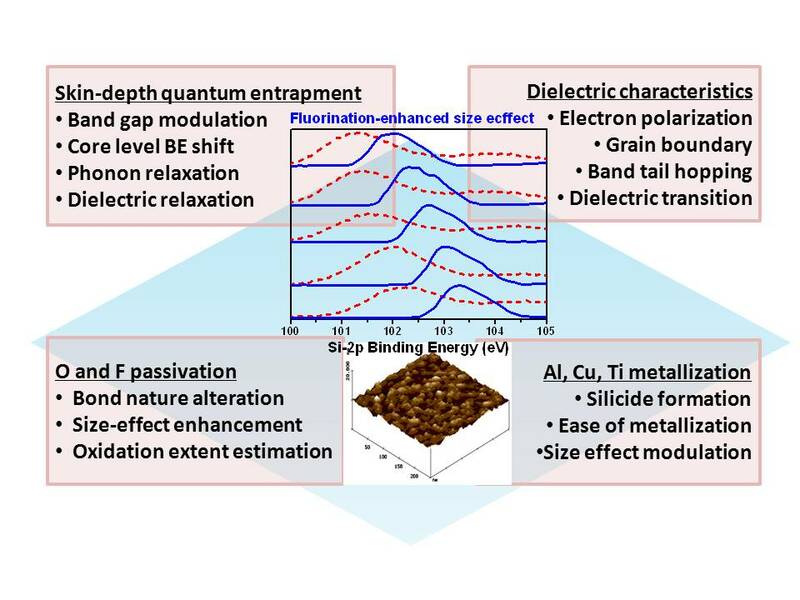 Focus will be given mainly on the band gap expansion, the blue shift in photoluminescence and photoabsorption, the electron-phonon interaction, the 2p energy level and the Raman frequency shift, and the dielectric suppression and relaxation as well as their correlations. We found that O and F passivation further enhances the size effect on the observations alteration and that metallization by ultrathin Cu, Al, and Ti coatings also modulates the properties to different extents. Consistency between theory [Prog Mater Sci 2003;48:521; ibid 2009;54:179] expectations and experimental observations clarifies that the unusual dielectric, optoelectronic, and vibronic behavior of the passivated and the pure nano-Si is related directly to the bond nature alteration and the broken-bond-induced local bond contraction and the associated quantum entrapment in the surface of skin depth. Most strikingly, incorporation of the theories to the measurements has enabled determination of the 2p energy level of an isolated Si atom and the vibration frequency of a Si–Si dimer as well as their shift upon bulk and nanosolid formation by matching predictions to the measurements using Raman and XPS, and the activation energy of conductivity of the nano-Si, which are beyond the scope of currently available approaches. Further exploitation on the correlation between the functionality and the developed knowledge would be even more challenging, fascinating and promising for devising advanced functional Si at will.